Soneva Fushi, the first "Robinson Crusoe" style hideaway in the Maldives, is set on the privately owned, uninhibited, tropical paradise island of Kunfunadhoo. 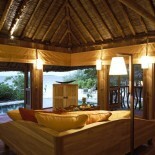 Soneva Fushi is situated in the Baa Atoll, north of Male' Atoll. There are 19 atolls that stretch over 800 kilometres made up of the 1,190 islands which are the Maldives. The island is accessible by a scenic 25 minute float plane flight from Male', the capital of the Republic of Maldives. In the North Baa Atoll region of the Maldives, is the amazing paradise island of Kunfunadhoo, home to Soneva Fushi luxury resort. Soneva Fushi, the first "Robinson Crusoe" style hideaway in the Maldives, is set on the privately owned, uninhibited, tropical paradise. Soneva Fushi, by Six Senses, is a world class retreat to get away from it all and the island is a little off the beaten track. A vacation here is an adventure in natural beauty and exclusive luxury, an adventure begins with a thirty-minute seaplane journey from Male'. The island of Soneva Fushi which is surrounded by a protective coral lagoon provides only sixty-five residences. This is a place that offers ‘Intelligent Luxury’ where guests can indulge in a host of activities, or simple do nothing at all. The retreat’s furnishings reflect a rustic tropical theme, which make you feel like you have escaped the busy world of hard angles and noise. The Island has a very good wine cellar and the dining diversities range from simple barbecues to full gourmet feasts. Nature is a feature on this remote Maldives paradise. The marine life and beaches are impressive. You can go on discovery excursions on the resort island as well as neighboring island villages. Then there is the wonderful Six Senses Spa, offering a menu of rejuvenating, pampering and holistic wellness treatments to calm mind and body. Excellent diving opportunities are also supported by a professional dive school. Soneva Fushi represents a superb eco-journey for families and couples, who often return each year to share memories with people who enjoy the same values. Stay for a week or stay for two, and prepare to be spoiled. Kunfunadhoo is 1,400 metres long and almost 400 metres wide, is one of the largest islands in the Maldives. Apart from the crystal clear waters, for which the Maldives is world-renowned, the island's unusually rich vegetation provides a unique natural experience. Villas and rooms are scattered along the beach and tucked into the lush greenery, providing the ultimate in privacy. The sheer size of the island allows an enjoyable exploration by bicycle or an energetic run on one of Soneva Fushi's hidden jogging trails. The absence of major hotel development in the Baa Atoll leaves one spoilt for choice of desert islands to picnic on. Most of the dive sites you will explore are new discoveries made by Soneva Fushi. Complementary: •	20 min Six Senses Spa Treatment Experience per person •	Sunset Beach or Sandbank Cocktail Party (Tuesdays only) •	Selection of Teas & Fresh Coffee making amenities in the villa •	Complimentary Soneva Mineral water in the villa •	Any non-motorized Water sports activities (Windsurfing, Hobicat sailing and Canoeing, etc) •	Regular Yoga & Tai chi sessions to balance the body and mind •	Sauna & Steam at the Six Senses Spa •	Bicycle riding •	Table tennis •	Snorkeling gear •	Boules •	Windsurfing & hobicat sailing - Virtual Tour •	Many board-games such as Chess, Backgammon, Trivial Pursuit •	Video and Compact Disc library and equipment available for guest rooms •	Jogging •	Badminton •	Canoes •	Tennis Court •	Fitness Centre Extra: Water Activities & Tour Centre •	Diving School, fully equipped with the latest high tech diving equipment •	Our professional instructors will train you to be PADI certified in less than a week •	Six Senses Spa (Holistic, Beauty and Body treatments) Virtual Tour - Six Senses Spa Inside Virtual Tour - Jungle Champa •	Snorkeling Excursions •	Speedboats •	Waterskiing •	Wakeboarding •	Cultural Excursions to nearby villages •	Desert Island Retreats - Virtual Tour •	Fishing Trips Diving at Soneva Fushi with Soleni Dive Centre.